This pleasant movie is not for everyone, but will appeal to all who enjoy football and perhaps especially Browns fans. Kevin Costner plays Sonny Weaver Jr., general manager of the Browns, on the day of the NFL draft. I personally didn’t realize what a big day this is in the NFL, with managers trading their spots for the picking, last-minute phone calls everywhere, calculators spinning out costs, and players biting their nails. Costner has never been a favorite of mine, as I think he tends to play wimps and play them badly, but here he may be well cast. Ivan Reitman (No Strings Attached) directed and the screen play was written by Scott Rothman and Rajiv Joseph. Weaver is probably grieving, having just returned from his father’s funeral a couple of weeks before. His father was the well-loved coach of the Browns until he fired him the year before. He’s been in his job for only a couple of years and he is facing some conflicts with his “secret” girlfriend, Ali (Jennifer Garner, Alias, Juno), who also happens to be his employee. He’s under a lot of pressure to get the team moving with his draft choice and when he has the opportunity to get the number one pick, it would seem that his worries are over. But doubts plague him even as everyone assumes that he’ll for sure pick Heisman trophy winner Bo Callahan (Josh Pence, The Dark Knight Rises, The Social Network). He had spent time looking at Vontae Mack (Chadwick Boseman) and Ray Jennings (Arian Foster), son of a former Browns star and he likes both. Cleveland Browns’ fans will enjoy the negative humor about how bad the Browns are, and those of us who like football but haven’t been among the millions who witness the draft every year will have fun discovering its intensity. I was in suspense for much of the time, as Weaver dealt with his indecision by talking with potential draft picks and dealing with his boss (Frank Langella), his coach (Dennis Leary), his staff, his girlfriend and his mother. His mother (Ellen Burstyn) feels the need to scatter her husband’s ashes on the practice field that day. Owner Molina (Langella) wants Weaver to make a “splash” and the splash to him can only mean Bo. The film might have risen to excellence with snappy dialogue, better-developed characters and less predictable subplots. Maybe the ashes scene wouldn’t have occurred (Could his mother be that insensitive to what the day meant?) had there been more intrinsic meaning to the plot. All day long Weaver tries to get Ali alone so that they can resolve an issue, but that seems odd since she isn’t going anywhere and they both know the stakes that ride on his pick. It seems like filler. On the other hand, all of the characters do fit the bill. Langella as the cocky owner Molina is amusing and Pence as Callahan is just as cocky in his own college boy way. 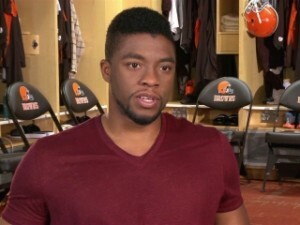 Boseman does a good job of giving us Vontae Mack, a guy who really wants to join the NFL but also has a life. Dennis Leary as Coach Penn does not come off as a coach and I say this even as I know zero about what NFL coaches are really like. He just doesn’t seem to put a whole lot of energy into the part and perhaps his lines could have been better. What we want, after all, is not a “real” coach, whatever that is, but a movie coach that we can believe in. Costner is his usual low-key self but it works here in a funny way since he’s a grieving jock who can’t express himself very well and says so. He comes to life in the final moments but I suspect that in those moments we see all of which he is capable. Costner’s single expression as an actor fits the movie and action spins around him. I never thought I’d go to see another of his movies but this one was fun. This movie is not going to win any awards but it’s interesting and suspenseful and not a bad way to spend an evening, particularly if you live in Cleveland. And hey, we won this one. They were going to film in Buffalo but Cleveland was cheaper.